I will never again get a refrigerator that doesn't have a frost free feature. Whether on the back bottom shelf or the top front, temperature stays even and I'm never unpleasantly surprised by frozen or spoiled milk. I always read reviews and the comments that consumers leave online. Thus, I came back to leave a review and let you know that this refrigerator is one of the best product I have invested on. It still amazes how can one product have so many features that are capable of amusing me. Overall, this product works perfectly fine and I highly recommend it to anyone. I recently had to downsize my life and had to obtain a new refrigerator on a budget. I perused the various consumer journals for what seemed like hours and finally chose a Dacor. After price shopping online, Appliances Connection had exactly what I wanted for much less than I was planning to spend. Next time it'll be my first stop shopping for the rest of my appliances. 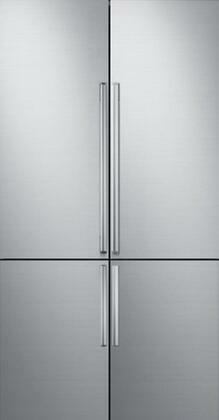 I am so fulsome in my praise of this refrigerator my friends and family are almost convinced I work for Dacor. My kids absolutely love the water and ice dispenser on our Dacor refrigerator. I think they just love pressing the buttons! Either way, the design looks terrific in our kitchen. My wife loves the nearly seamless design of our new Dacor fridge. Blends in perfectly with our existing kitchen cabinetry so that’s a plus! When looking for a fridge, I was very particular about the exterior dimensions because I wanted it to be exactly flush with my counter. Happily, AppliancesConnection.com had a complete measurements listing and I was able to find this Dacor refrigerator which fits perfectly. My previous refrigerator never had spacious drawers and shelves. I ordered this product hoping that it will have a spacious interior design because my kitchen itself is already so small. So I couldn’t get bigger ones. As I hoped it is indeed what I wanted has slim exterior design and very spacious interior design. This fridge has something for everyone. The design looks great in my kitchen and there are so many convenient features throughout this fridge.